Robert R. Spatz, loving father, Naval aviator and aeronautical engineer, passed away of natural causes on March 31, 2019, at the age of 95. A viewing will be held from 9-10 a.m. on Saturday, April 13, at Sts. Peter and Paul Catholic Church in Abie, Nebraska. A parish rosary will take place at 9:30 a.m. April 13 at Sts. Peter and Paul Catholic Church in Abie, Nebraska. A funeral mass is set for 10 a.m. April 13, also at Sts. Peter and Paul Catholic Church in Abie, Nebraska. Burial will take place April 13 at Sts. Peter and Paul Catholic Cemtery in Abie, Nebraska. Born on Oct. 6, 1923, in Abie, Nebraska, he was the son of James L. Spatz and Marie Rose Voboril. After graduating from David City High School in 1941), Robert enlisted in the U.S. Navy, where he became a plank holder on the USS Midway aircraft carrier. After serving as an aircraft structures mechanic on the Midway, Bob pursued his wings at NAS Pensacola and became a Naval aviator with fighter squadron VF-32, where he was known as “Tooey” Spatz. He married Jo Clare Thomas of Clarendon, Arkansas, in 1953, and at the close of the Korean conflict, Bob entered the Naval Reserves and attended Tri-State College, Indiana, for his Bachelor of Science degree in Aeronautical Engineering (1955). 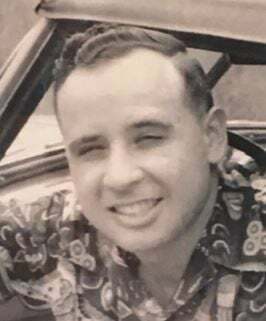 Following Bob's matriculation, the Spatzs settled in the Los Angeles area, where Bob enjoyed a long and fulfilling career as Project Engineer at Northrop Aircraft in Hawthorne, California, working extensively on the F-5 and T-38 fighter-trainer aircrafts. After his retirement from Northrop in the 1990s, Bob moved to Mission, Texas, where he enjoyed traveling, dancing, big band music and continuing his life-long love of learning. Bob is survived by daughter Elizabeth (Libby) Spatz of Torrance, California, and nieces Elizabeth (Betty) Betzen, Phyllis Byers, and Genie Stratman. Bob was preceded in death by his parents; his brothers, Jimmy and Edwin; and sisters, Gladys and Marian. Arrangements by Chermok Funeral Home, David City.